The Umblical chord is cut by mid-wife holding a SILVER-COIN or a Silver Instrument. GURANI– Mixture of Ghee and Milk. After the birth, the mother is made to drink Gurani. BADHAI – Relatives congratulate the Birth by offering Turf leaves with one Rupee. SUTAK or SAKOR days – Period of impurity of mother and family ( Generally 10 days). GUNTR or Dassotan – Infant’s First Ceremony. MURA (Gur or Parched Rice or Wheat Grains ) is distributed in the naming ceremony. Among the KOLIS, the boys are often named after the day or month. e.g. Manglu for a boy born on Tuesday (Mangalvaar). Kinnauri people often use the suffix ‘NEGI’ after names of the child. In Shimla district, sons are often named after the father. Among the Khashas and Kolis, taking up a new family name is prevalent. Dheri – The payment made by Boy’ father to Girl’s father for defraying the expenses of marriage. 1. Orthodox Form – usually conducted with Hindu rituals. It is called as BARNI in Upper classes. 2. BATA-SATA – It includes inter-familial exchange. No money is exchanged but Marriagable boys and Girls are exchanged. 1. Biah – It is the regular kind of marriage according to the Shastras. Genearally followed by the prosperous people of the state. 2. Jhajra and Gaddar – This marriage takes place without holy fire or Shastra. It is typical in Pahari Areas. Bridegroom with relatives visit Girl’s House taking NATH (nose-ring) with them. The Priest inserts NATH in the Girl’s Nostril. Then the girl comes along to boy’s house. Gharasni (eating of GUR) takes place and the marriage is completed. Then after 3 days, Bride’s parents visit her. This visit is known as MURAPULL. 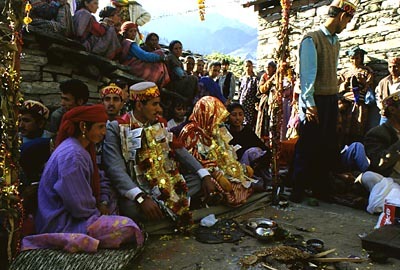 In KULLU, this type of marriage is known as PUTTIMANAL, where instead ofNATH, a Cap is put on the bride’s head. GADDAR marriage is same as JHAJRA except there is noGANESHA Worship in Gaddar. 3. Jhind Phuki (in Chamba) or Jhara Phuki – It stands for ‘Bush Burning’. It is a kind f run-away marriage found among the Gaddis of Chamba. 1. Haar– When a boy kidnaps a girl or a girl elopes with her lover. In Kinnaur, Haar is known as DUBDUB or KUCHIS or KHUTU KIMA. 2. Reet Marriage – When a married woman elopes with lover. Reet System of Divorce- First husband is re-imbursed by the new husband or the girl’s father. Sometimes , a small stick called as ‘Dingi’ is broken by divorcee to complete the Divorce. In Lahaul, couple prepares a thread of wool and breaks apart to complete the divorce. 3. Widow Re-marriage– In Chamba and Kangra, it is called as JHANJHARAR or GUDANI. In Shimla, it is called as KAREWA.